Several years ago, I was a member of a local amateur dramatics group, The Centralian Players. 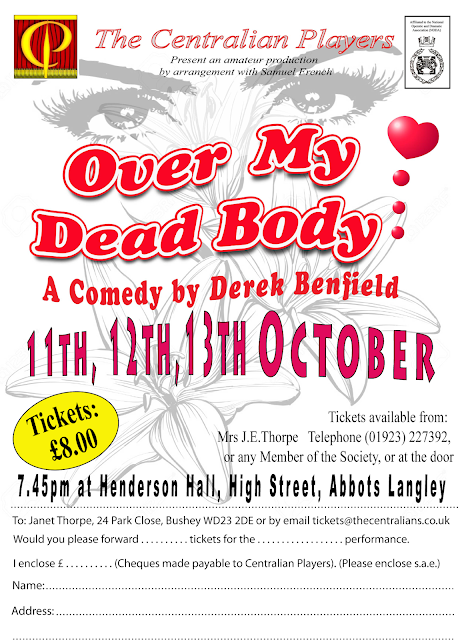 Anyway, the group's October production, Murder in Rehearsal by Angela Lanyon, opened last night at Henderson Hall in Abbots Langley, so I thought I would pop along to check out the newcomers ... and perhaps look into the possibility of returning to the fold*. I have to confess that I thought it was a bit of a mixed bag on stage last night, from the usual strong performance by Steve through to the mime-artist-caught-in-the-headlights performance by one of the newer girls. For one guy, Dean, it was his first ever appearance on stage and, despite struggling with some of his lines, he put in quite a natural performance. There were two points in the play where I found I was in danger of laughing out loud at inappropriate points. It started when Wendy Read appeared on stage dragging a large, straw-woven basket and the old lady sitting to my right leaned over to her colleague and announced, not so quietly: "She's put a bit of weight on, hasn't she!" I have to confess that she didn't say anything I hadn't already thought, which made it a whole lot funnier. If being old means you don't care what people think, then maybe I need to get there a little sooner!!! During the second half of the play, the character played by Jayne Dugan was wailing out over the audience about the death of Simon, who had been killed by a blow to the head. I believe the line she was supposed to say was along the lines of "head smashed in like a boiled egg". Instead, what just escaped her lips before she corrected herself was, "head smashed in like a boiled head". 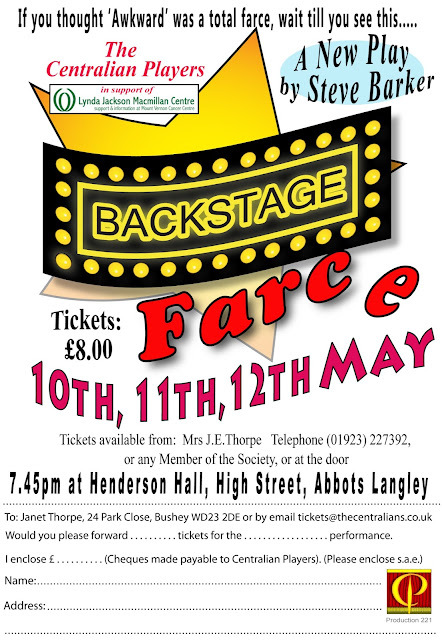 I guess I shouldn't really laugh, but hey, it is am-dram! After it was all over, I caught up with Diane who asked if I was coming back ... I now have an audition notice for their next play, House of Secrets by Peter McKelvey, so wish me luck next Thursday! That said, I think I might just do backstage stuff for the time being ... don't want to rush into this! * Its something that came up in the meetings with the life coach that I should do to try and build my confidence. Doesn't work, but it was fun doing it before!